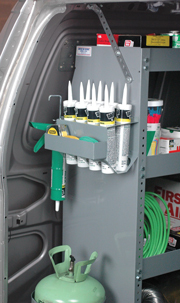 Put an end to searching for caulk or cleaning up after leaking tubes in your van. Now you can keep your caulking gun and up to eight 10-once tubes of caulk handy in this convenient new tray. Caulk gun holster is 21⁄2" square and holds standard caulk guns with or without tube in place. slots are 21∕8" in diameter.